This project allows food prepared but not served in on-board restaurants to be collected and distributed to local organizations that support people in need. Launched in Savona on July 22, 2017, the project currently operates in Italy, in the ports of Savona, Civitavecchia, Bari and Palermo, and has been exported as an Italian "best practice" to France and Spain, in Marseilles and Barcelona and, since last December, in Guadeloupe and Martinique as well. Over a period of 21 months, over 100,000 portions of food have been distributed to eleven associations who care for people in need. This has activated and reinforced a significant international network between local areas, local communities and ships, strengthening their interconnection. Costa Fortuna, the Italian company's 103,000 gross tons ship carrying a total of 3,470 guests, has returned to calling regularly at the port of Genoa, where it will arrive every Friday until November 8, for a total of 34 stopovers, offering 1-week cruises in the western Mediterranean. Every Thursday preceding the ship's arrival in Genoa, at the end of dinner, all the dishes prepared in the catering areas and not served to guests, so-called "ready-to-eat" meals, will be collected. The meals will be placed in appropriate aluminum containers, which will be sealed and labeled to ensure their traceability, and then stored in the ship's refrigerators. The following morning, after the ship has docked in the port of Genoa, the containers will be unloaded and handed over to volunteers from Banco Alimentare, who will deliver them to the “La Casa dell’Angelo – Opera don Guanella”, center in Genoa, which for 68 years has been caring for young people between the ages of 6 and 18 with severe social and family-related problems, providing them with education and social care, working with the various municipalities of Liguria and the Children's Court of Genoa. "This project to recover food from Costa ships is a good circular economy practice of which we are very proud - says Marco Lucchini, Secretary General of Fondazione Banco Alimentare Onlus. We are committed to fighting food poverty and waste, as required by the Agenda 2030 and the Sustainable Development Goals 2 and 12, so we are proud to have created a model with Costa Cruises that sensitizes citizens on the subject of waste reduction and is a concrete example of responsible consumption, with great attention paid to the social dimension." The Costa Cruises and Fondazione Banco Alimentare Onlus project, which contributes to the fight against poverty and social exclusion, has been made possible in particular by law 166/2016 against food and pharmaceutical waste promoted by Italian parliamentarian Maria Chiara Gadda, which came into force on September 14, 2016. The law reorganizes the regulatory framework that governs the donation of unsold food by introducing simplification, harmonization and incentive measures, allowing all kinds of food to be donated more easily and in an equally controlled and safe manner, but above all establishes the priority of recovering food to donate to the poorest people in Italy. 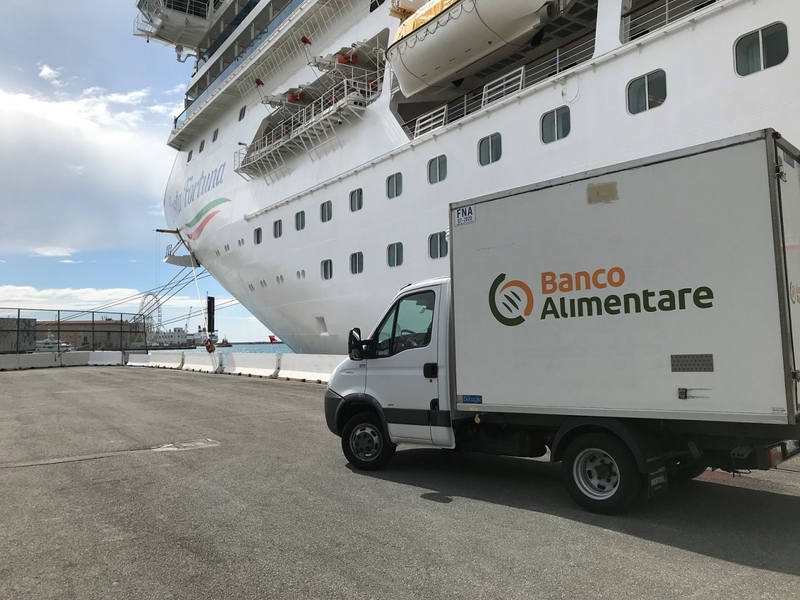 The donation of surplus food, managed in collaboration with Fondazione Banco Alimentare Onlus, is part of the 4GOODFOOD initiative, through with Costa Cruises was the first to decide to review the issue of food in a sustainable way. Thanks to its integrated approach, which begins with the preparation of dishes and gets both guests and crew members directly involved, 4GOODFOOD has set itself the ambitious objective of reducing food waste on Costa ships by 50% by 2020, 10 years ahead of the UN Agenda 2030. Since 1989, Banco Alimentare has been collecting intact and unexpired food which would otherwise be destined for destruction because it can no longer be sold. Rescued from going to waste, it regains value and becomes a resource for the needy. The Banco Alimentare network operates across Italy, every day, through 21 food banks throughout the country, coordinated by Fondazione Banco Alimentare Onlus. In 2018, Banco Alimentare handled over 90,000 tons of food, including 8,500 tons collected during the Giornata Nazionale della Colletta Alimentare® [national food collection day], which has taken place on the last Saturday in November, for the last 20 years, in almost 13,000 supermarkets, where 5.5 million Italians donate their shopping to the needy. Every day, the food is redistributed free of charge to 8,000 charities which help around 1,580,000 disadvantaged people in Italy, including 135,000 children between 2 and 7 years old. Banco Alimentare is able to operate thanks to the daily work of over 1,800 volunteers. Liguria's Banco Alimentare association supports the work of 394 charities working with 55,800 needy people across the region. Costa Cruises is an Italian company belonging to Carnival Corporation & plc, the biggest cruise group in the world. For over 70 years, the ships in the Costa Cruises fleet have been bringing authentic Italian-style hospitality and vacations to all the world's oceans, serving delicious food and selected wines, while offering unique shopping experiences and a wide range of famous Italian brands. The Costa fleet currently comprises 15 ships in service, all registered in Italy. In 2019 and 2021, two new, next generation ships fueled by liquefied natural gas (LNG), the "cleanest" fossil fuel in the world, are due to be delivered. Costa Cruises' sustainable development strategy is strongly focused on nutrition and the food supply chain. In recent years, very effective work has been done on the Italian company's ships to reduce food waste to a minimum.